DONALD TRUMP has been a champion of the rights of the unborn at least since 2015 when he announced he was running for president. But he has rarely expounded on his pro-life views in such vivid detail as he did during his State of the Union address on February 5th. Referring to a law passed in New York last month that would allow more late-term abortions he condemned lawmakers who “cheered with delight upon the passage of legislation that would allow a baby to be ripped from the mother’s womb moments before birth”. With regard to a similar bill proposed in Virginia, he accused Governor Ralph Northam of “basically” saying “he would execute a baby after birth”. He called instead for “a culture that cherishes innocent life” and said he would ask Congress to pass a law banning late term abortions. That is unlikely to happen. Democrats would not allow such legislation while they control the House of Representatives. In a nod to her support of abortion-rights Nancy Pelosi invited the president of Planned Parenthood, the biggest provider of abortions in America, to be one of her guests at the State of the Union address. But in any event Mr Trump was really saying something else when he railed against abortion in his biggest televised speech of the year: pro-life Americans should vote for him in 2020. Mr Trump would be missing a trick if he did not make abortion a big issue in the run-up to America’s next presidential election. Since Jerry Falwell and the leaders of the Moral Majority movement seized onto abortion in the late 1970s it has become the single most important voting issue for many religious conservatives—and therefore one of Republicans’ most powerful rallying cries. In 2016, in part thanks to his opposition to abortion, Mr Trump secured the vast majority of votes of white evangelicals. He needs to hold on to them. The new law in New York, and the attempt to pass a similar one in Virginia, have given him the perfect opportunity to attempt this. Both would loosen restrictions on late-term abortions, the kind that gives pro-lifers their most inflammatory, which is to say most grisly, publicity. In New York, abortions were previously allowed after 24 weeks only if a woman’s life was at risk or if the fetus was not viable. The new Reproductive Health Act allows them if the woman’s “life or health” is at risk, a much vaguer definition. Having won control of the state Senate in November, Democrats passed the law largely as a precautionary measure. 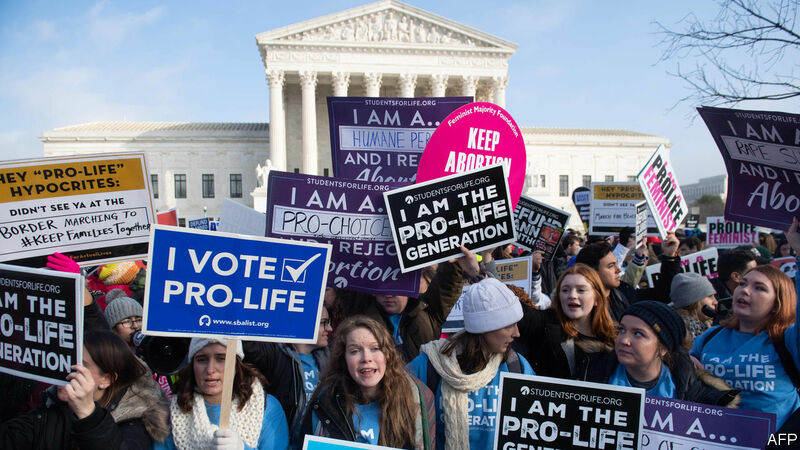 They want to extend access to abortion in the event that the Supreme Court overturns Roe v Wade, the ruling from 1973 that recognized a woman’s right to have an abortion (until around 24 weeks or later if her life or health were at risk). During his presidential campaign Mr Trump suggested that Roe would “automatically” be overturned with the appointment of conservative justices and that it would then be up to the states to decide whether abortion would be legal or otherwise. “With the signing of this bill we are sending a clear message that whatever happens in Washington, women in New York will always have the fundamental right to control their own body” said Andrew Cuomo, New York’s governor, as he signed the law on January 26th, Roe’s 46th anniversary. The problem for Democrats is that though late term abortions are rare—in 2015 1.3% of abortions in America took place after the 21st week—they are extremely unpopular with the public. Most Americans want Roe v Wade to stand. But when pollsters ask them about late-term abortions they give a different answer. According to Gallup only 13% of Americans believe abortions in the third trimester should be “generally” legal. The political potency of late-term abortions was evident in the 1990s when conservatives coined the term “partial birth abortions” to describe a rare type of late-term abortion, and some Democrats voted with Republicans to ban them. Now other states, including New Mexico and Vermont, are considering the introduction of new laws like New York’s. If they do, Mr Trump will be waiting. On February 7th, at the national prayer breakfast in Washington DC, the president reminded the gathered religious and political leaders that he was a pro-life Christian. “All children born and unborn are made in the holy image of God”, he said.